So during last night’s desperate attempt to catch up with my NaNo word count, @kseniaanske decided it would be fun to do a ferret sprint. As I love me some furry little critters, I couldn’t resist the challenge. A gets full credit for this bit, because he suggested it! Here’s mine now, just because the whole thing amuses the pants off me. Enjoy! Meg had been in school now for about three months. She felt like she was really getting the hang of this whole magic thing. Flying had been scary as hell, but thrilling all at the same time and once she’d gained a bit of confidence, Dana’d had to threaten her with no flying for a month to get her to land. Today was her first lesson in conjuring. She’d been up most of the night with these grand ideas of floating sugar castles and whirling ice storms. Did she have any real idea what conjuring involved? Absolutely not. Dana walked into the work room with a particularly smug look on her face. Prickles of worry started to gnaw away at Meg’s excitement. Sure, it had only been a few months, but she’d already learned to be wary of that look. “So. Are you ready to learn conjuration?” Dana practically purred. Aw hell. This was gonna be bad. But there was no way she was backing down now. So Meg nodded. How bad could it be, really? “That’s the spirit. How familiar are you with ferrets?” Dana perched on a stool, looking not unlike a pixie bent on destruction. “Okay, wily, chewy, stinky. Got it. So what do ferrets have to do with conjuration?” Meg’s impatience was growing. She was tired of talking. She wanted to do. Was this a glaring Achilles heel that Dana was going to exploit? You’re darn skippy it was. Dana smiled a slow, toothy smile. Meg paled, her freckles jumping off her face as it turned papery. Patience, she berated herself. How many times over the last few months had Dana nailed her for lacking patience? Her eyebrows had only just grown back from the last lesson. “Totally. I’ve got this.” Meg concentrated on the ferret in the cage. She closed her eyes and saw another appear right next to it. There was a soft pop, like a bubble. Meg smiled. Nailed it! She opened her eyes and looked in triumph on the two ferrets in the cage. Ferrets started popping up all over the workroom. Furry, squirming bodies covered the floor and every available surface. They crawled over her lap, around her shoulders, nestling in her hair, and nuzzling her ears. Oh gods. What had gone wrong? Meg turned to Dana, only to see her teacher doubled over with tears streaming down her face. Also, curiously free of ferrets. “Did I not mention that you have to be very specific about quantity and when to stop delivering the objects that you conjure? It must be an age thing. The memory is the first to go and all that.” Dana clung to the table, gasping for breath. “Funny. Hysterical even. Are you done yet?” Meg was starting to panic. These things were multiplying like tribbles. Dana gave one last whoop of laughter and waved the ferrets away. As promised, here is a snippet of the WIP I’m writing for NaNoWriMo. Meg settled Mr. Floppy on her bed against the pillow and looked around. It wasn’t quite home, but it would do. She’d made it as comfortable as she could, but it still seemed stark and impersonal somehow. She wished that it looked more like her room. Maybe then she wouldn’t feel so homesick. Everyone had walked with her to the school’s entrance. It was actually an old boarded up storefront next to an antique store that no one ever went to. There’d been hugs and kisses and more than a few tears. She’d gotten a few nifty presents from her friends. A journal she could write notes in that would appear in a matching journal that Kristen had. It was better than email, especially considering that her laptop wouldn’t function at the school. Trey had, naturally, given her a completely inappropriate box of magical pranks. Candy to turn your teeth green, disappearing ink, stink bombs, and other things she was afraid to touch. Nevermind the fact that she’d have no one but herself and the mysterious teacher to use them on. Jamie gave her a whistle. She’d thanked him, confused, and tucked it into her pocket. He’d reached into her pocket and pulled it back out. Wow. That was pretty neat. Also, totally like him to give her something to defend herself with. Meg had stalled as long as she could, but eventually all the goodbyes had been said and a last round of hugs given. She’d stepped through the door and into the school. It was incredible. Gold laced marble floors, warmly glowing chandeliers, dark rich wood. There were even tapestries hanging on the walls for crying out loud. Soft and rich, depicting all kinds of scenes that Meg had read about in fairy tales and never thought were actually based in truth. She’d looked around, wondering if she was supposed to check in and where. It was so quiet that Meg felt like she was in a library and worried that she might be breathing too loud. Meg’s bags had torn themselves from her grip and started floating off up the stairs. Bemused, she’d followed. Clearly being alone at school was far more literal than she’d thought it would be. So now she was sitting in her room, missing her parents and familiar surroundings, trying not to cry. She refused to give in to such a childish thing as tears on her very first day. The tears started to leak out anyway. She needed a distraction, like now, or she’d be bawling like a baby. She seized on her Dad’s demonstration of magic powers. Her room could look more like home. Thanking her Dad, Meg closed her eyes and concentrated. She didn’t want it to look just like home, that would only make things worse. But it needed to look more like her. As she pictured things, the room around her transformed. The plain white walls, became papered in delicately swirled blues and greens, the loops and whorls resembling ocean waves. The bare wooden floor acquired a plush, blue carpet that felt silky and warm under her feet. Next, a comfy green couch appeared in front of the fireplace with a low stone coffee table in front of it. Bookshelves grew into the wall next to the fireplace and a spacious desk settled itself under the window. Much better. This was a room she could live in for the next year. Feeling happier, but a bit drained, Meg lay down and snuggled her bunny. A short nap wouldn’t hurt and she was sure that if she had to be somewhere, she’d be fetched. It’s coming, folks. Like a freight train. It’s unavoidable! Well, okay, it really is avoidable. You don’t have to participate. But darn it, it’s just FUN. 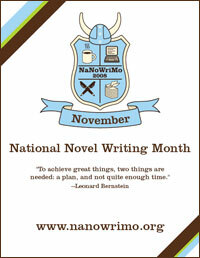 Naturally, I’m talking about that November insanity inducing awesomeness, NaNoWriMo. I’m busily working on my WIP, hoping to slay a huge chunk of it next month. I may not hit the 50k goal, but whatever number I reach, I’ll be that much closer to the end of my novel. Thus it = win. We were chatting on the Writer’s Huddle (membership is open for like two more days if you’re interested) about the rules. Many of us view them more as guidelines, than rules. *slaps on an eyepatch* Arrrrr! I say, don’t get stressed about it. While it’s a GREAT exercise for helping to build writing stamina and discipline (remember, 21 days is all it takes to make a habit), it shouldn’t make you dread writing. That totally defeats the purpose. With that in mind, I’m sure that any of you out there who are planning to participate are just as intent on preparing yourselves as I am. So here are some of the resources that I’m using. How to Write Faster – This is designed for blogs, but it totally applies to anything else! 2,000 to 10,000 Words a Day – I am so not there yet, but I aim to be someday. Also, Rachel has expanded all of her techniques into a short book that is available on Amazon. It is on my list of MUST HAVES. Holly Lisle – Pretty much anything this woman teaches about writing is pure gold for me. Your mileage may vary. Brandon Sanderson’s Lectures – I have much love for this site. It ranks with cupcakes. Becca Weston – totally nails it in this post! Scrivener – It is amazing. Quite possibly the best money I’ve spent on software (this includes games!). Do you have favourite NaNo prep tools? Share them in the comments. Also, check back. I’ll be posting my progress through the entire month of November. If you want me to cheer you on, just let me know! Fall has officially… fallen? This is my favourite time of year. Autumn, leaves, weather change (cause good gods do I hate me some summer heat), Halloween, the onset of winter, and NaNoWriMo. I’ve actively participated really just last year. I signed up to participate a couple of years ago and stuff just got in the way. That sucked, but last year I pushed things aside and demanded writing time to work on this. It helped a TON. I got to just around 30k ish words. This year, I’m going to hit 50k. Hmm. That doesn’t sound quite right. I think that’s the wrong plan. There we go! Sure there are details missing, but it’s going to happen goshdarnit.